This entry was tagged aquarium, aunt, birthday, fish, grandfather, grandmother, New Orleans, penguin, shark, uncle. Bookmark the permalink. 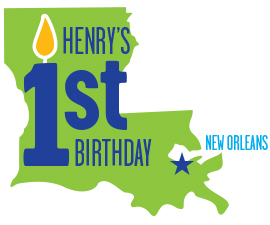 Happy Birthday sweet little Henry! I have to use little as much as possible now because I will not have the chance much longer, as you continue to grow each and every day. You have brought a world of joy to all of us with your sweet smile, laugh,,and playfulness. From all of the Hess’s we hope you had an amazing 1st birthday! We love you! This post makes me all teary eyed, reading your words, knowing the feeling, and full of joy to have him in our lives and see you all do these wonderful things together. What a great little gift to us all he is and we love him so so much. Happy Birthday Henry! Thanks to both sisters for loving Henry so much! We love you both too, very much! Henry is lucky to have you both. Love you!